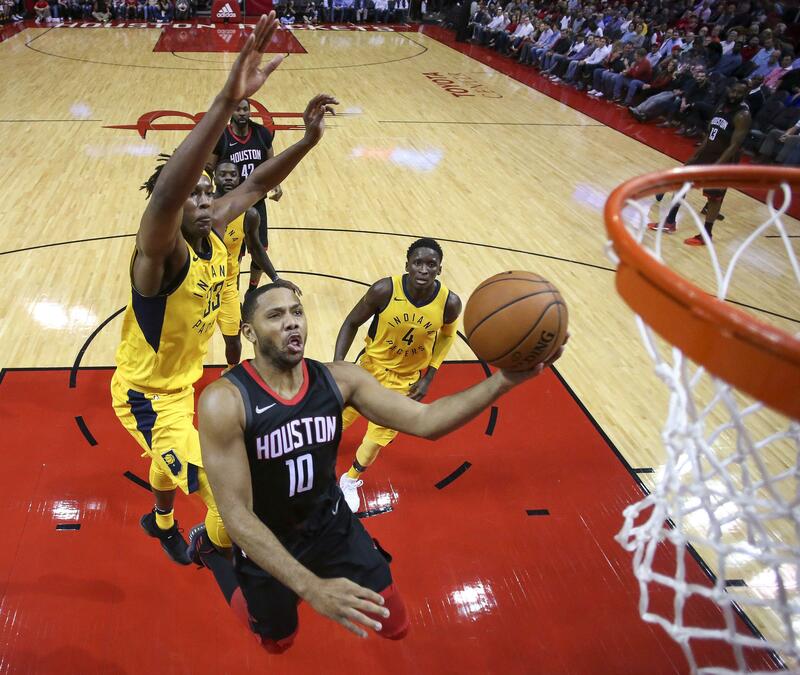 HOUSTON – James Harden had 29 points, 10 assists and eight rebounds and the Houston Rockets rolled past the Indiana Pacers 118-97 on Wednesday night for their sixth straight victory. The Rockets improved to 12-1 this month, with the only loss coming on Nov. 14 against Toronto. Young had 23 points for the Pacers. SAN ANTONIO – LaMarcus Aldridge set his San Antonio high with 41 points and the Spurs spoiled J.B. Bickerstaff’s debut as Memphis coach, handing the Grizzlies their ninth straight loss. Aldridge established a season best for the second consecutive game, topping his 33-point outing Monday against Dallas. Tony Parker had 10 points and five assists while playing 18 minutes in his second game back since undergoing surgery to repair a torn left quadriceps tendon. San Antonio is the first NBA team with 10 home wins this season. It has won three in a row overall. The Grizzlies continued to play short-handed in their first game since coach David Fizdale was fired. Memphis was without Mike Conley, Chandler Parsons, Mario Chalmers and Brandan Wright. Tyreke Evans led Memphis with 22 points. ORLANDO, Fla. – Aaron Gordon had 40 points and 15 rebounds to help the Orlando Magic end a nine-game losing streak with a victory over struggling Oklahoma City. Russell Westbrook hit five 3-pointers and scored 20 of his 37 points in the fourth quarter for the Thunder. He shot 7 for 10 on 3s and added 11 rebounds, five assists and five steals. Oklahoma City lost for the fifth time in six games and dropped its seventh straight on the road. Elfrid Payton added 19 points for the Magic, and Evan Fournier had 16. NEW ORLEANS – Andrew Wiggins scored 28 points to help Minnesota beat New Orleans in a game that saw Pelicans forward Anthony Davis ejected for the first time in his career. Jimmy Butler and Gorgui Dieng had 19 points each for the Timberwolves. With Minnesota leading 45-43 in the second quarter, Davis was called for a technical foul. Fifteen seconds later, he picked up his second tech and was ejected. Minnesota responded by finishing the half on a 17-6 run to take a 62-49 lead into the halftime locker room. Davis finished with 17 points and five rebounds. Jrue Holiday led New Orleans with 27 points. NEW YORK – Enes Kanter had 22 points and 14 rebounds and New York beat Miami despite losing Kristaps Porzingis to a sprained right ankle after 2 1/2 minutes. Courtney Lee added 17 points for the Knicks. Kelly Olynyk had 18 for the Heat. PHILADELPHIA – Ben Simmons had 31 points and a career-high 18 rebounds and overcame a Hack-a-Shaq strategy, leading Philadelphia past Washington. Joel Embiid had 25 points and 14 rebounds, and Dario Saric added 24 points to help the Sixers win for the sixth time in eight games. Kelly Oubre Jr. scored 22 points for the Wizards. Washington nearly overcame a 22-point deficit in the fourth quarter and spent the final five minutes intentionally fouling Simmons, who entered the game shooting 56.6 percent. He went 15 for 29, but made six of his last eight. His 24 attempts in the fourth were an NBA record for a quarter, according to ESPN Stats & Info, and the 29 overall set a league mark for rookies. DETROIT – Reggie Jackson scored 23 points and Detroit beat Phoenix for its third straight victory. Tobias Harris and Avery Bradley each scored 20 points, and Andre Drummond had 13 points and matched a career best with seven assists in Detroit’s highest-scoring game of the season. The Pistons improved to 14-6 overall, 8-2 at home in their first season at Little Caesars Arena, and 7-1 against the Western Conference. TORONTO – Kyle Lowry scored a season-high 36 points, DeMar DeRozan had 30 and Toronto beat Charlotte to improve to 7-1 at home. Lowry made career-high eight 3-pointers. Dwight Howard had 22 points and 10 rebounds for the Hornets. They lost their seventh straight road game and dropped to 1-9 away from home. DALLAS – DeMarre Carroll scored 15 of his 22 points in the third quarter to help Brooklyn beat Dallas. Trevor Booker had 16 points and 10 rebounds, and Spencer Dinwidde added 19 points for the Nets. Harrison Barnes had 17 points for Dallas, Maxi Kleber added a career-high 16, and Dwight Powell had 14. LOS ANGELES – After struggling from long range all night, Stephen Curry hit two quick 3-pointers to open overtime and the Golden State Warriors outlasted the Los Angeles Lakers. The victory prevented the Warriors from losing two straight games for the first time this season. Kevin Durant led Golden State with 29 points, while Curry added 28 and Klay Thompson 20. Curry had 13 points in overtime. Brandon Ingram scored a career-high 32 to lead the Lakers. Kentavious Caldwell-Pope and Jordan Clarkson had 21 each, and Julius Randle scored 20. Published: Nov. 29, 2017, 10:44 p.m.